The pool of Bethesda (House of Mercy) was a place believed to be enchanted. Occasionally, an angel would dip its foot in the pool and stir it. The disabled person who was first into the pool would be healed. Dozens of disabled and sick surrounded the pool, hoping to be the first in. Jesus found one man who was unable to enter the water soon enough to be healed, and healed him. We do not see in the story the Savior stayed long enough to heal anyone else. Instead, the healed man is soon approached about carrying his bed on the Sabbath, and he claims that his healer told him to do so. Arriving at the pool, the man and the Pharisees do not see Jesus among the sick. Obviously, the Lord has not stayed to heal others. Why not? Here we have an event that is extraordinary. Whether an actual angel healed randomly at the pool, we do not know for certain. However, recent archaeological digging has uncovered a pagan healing shrine next to the pool, dating back to the times of Christ. The shrine is to the Semitic God Eshmun, the god of healing. The pool of Bethesda lies outside of the city walls, and therefore not considered part of the holy city or in the suburbs of the temple. It is near a Roman fortress, Antonio. Therefore it is very possible that this pool was believed to be magical due to the angel of a god or goddess. Even as Moses confronted the priests and magicians of Egypt, and Abraham confronted Pharaoh for priesthood primacy (Book of Abraham 1), Jesus would confront the pagan god of healing. Christ showed forth his power to heal the disabled, and demonstrate his divine status at the altar of a pagan god. Others would have seen Jesus heal someone who laid by the pool for years without being healed by the pagan god. This would give Jesus potential divine status, not only among the Jews, but among the Romans and foreigners in the city, as well. Jesus: Son of God or blasphemer? This would also explain the reactions of the man who was healed. When the Pharisees asked him why he was disobeying the Sabbath by carrying the bed, he had no problem in helping them find Jesus. The healed man, though probably grateful to an extent, was definitely not a disciple of Christ. Perhaps he was also not a Jew, as he sat at a pagan healing shrine for years waiting to be healed. Keeping in line with the religious leaders in Jerusalem was politically smart for someone eager to enjoy his new life. “17 But Jesus answered them, My Father worketh hitherto, and I work. “18 Therefore the Jews sought the more to kill him, because he not only had broken the sabbath, but said also that God was his Father, making himself equal with God” (John 5). Jesus now claimed godhood as the literal Son of God. He challenged the pagan god. Now he would challenge the defenders of Yahweh’s temple and the Torah (writings of Moses). Jesus was changing the long held beliefs and rules of the Sabbath. Why? Because he was the Son of God and had the power to do as he thought best on that day. Second, the Savior’s claim that he was the Son of God put them into the position of either accepting that he was worthy of worship, or to reject him as a blasphemer, worthy of death. There would be no middle ground or sitting on the fence. Either he was the Messiah, or he was not. The Jews chose to believe he was a fraud and despite healing an invalid, they decided to plan his death. Jesus understood the law of witnesses. If a man witnessed alone, his testimony was left in doubt. But if the man had solid witnesses, then he could be considered trustworthy in his testimony. Jesus first provided John the Baptist as a witness for him. Second, God himself would be a witness. How? "19 Then answered Jesus and said unto them, Verily, verily, I say unto you, The Son can do nothing of himself, but what he seeth the Father do: for what things soever he doeth, these also doeth the Son likewise. "20 For the Father loveth the Son, and sheweth him all things that himself doeth: and he will shew him greater works than these, that ye may marvel. "36 But I have greater witness than that of John: for the works which the Father hath given me to finish, the same works that I do, bear witness of me, that the Father hath sent me." Jesus saw that God the Father could heal and raise men up. God raised men from the dead through prophets such as Elijah, Elisha, and others. If Jesus were truly God’s son, then he would also have this power, which indeed the healing of the disabled man was proof of. Jesus’ miracle was proof that the Father had shared his power with the Son. This was the testimony given by God of his son, Jesus Christ. "29 And shall come forth; they that have done good, unto the resurrection of life; and they that have done evil, unto the resurrection of damnation. "30 I can of mine own self do nothing: as I hear, I judge: and my judgment is just; because I seek not mine own will, but the will of the Father which hath sent me." "37 And the Father himself, which hath sent me, hath borne witness of me. Ye have neither heard his voice at any time, nor seen his shape. "38 And ye have not his word abiding in you: for whom he hath sent, him ye believe not. "39 Search the scriptures; for in them ye think ye have eternal life: and they are they which testify of me.
" 40 And ye will not come to me, that ye might have life." The Jews would not or could not receive a witness of Jesus through the Spirit. They rejected that personal revelation and witness from God. The only witness available to them were the scriptures. Sadly, the Jews thought their eternal life came from obedience to the law of Moses and the sacrificial rituals therein. They focused on keeping the Sabbath holy by not carrying beds, and in focusing solely on the literal letter(s) of the law, they missed the verses prophesying of the coming Messiah. True eternal life does not come from the scriptures, but from devotion to God through his Son, Jesus Christ. The Jews had the scriptures, thinking they were saved by studying it copiously. Instead, it became an albatross around their necks, preventing them from accepting the Son of God, even he who commanded Moses in the first place! And because they would not come unto Christ, they would not have eternal life. Interestingly, many Christians, including Latter-day Saints, use verse 39 out of context, as encouragement to study the scriptures. In context, we find that the scriptures are good to learn about Jesus, but they will not save us, heal us, or return us back into the presence of God. The Jews showed that the scriptures, when used improperly, can be used to justify a lifestyle that is blind to true devotion to God. The Bible, while the word of God, is not where one obtains God’s authority nor power. Instead, Jesus showed that he was the true source of power and authority. The scriptures may help us to understand Jesus and his holy work, but they are not a replacement for having an actual devotion and covenant with Christ the Savior. "45 Do not think that I will accuse you to the Father: there is one that accuseth you, even Moses, in whom ye trust. "46 For had ye believed Moses, ye would have believed me: for he wrote of me. "47 But if ye believe not his writings, how shall ye believe my words?" Moses would condemn them, for Moses’ law and teachings were geared to lead mankind to Christ. Since the Jews had twisted the prophetic words to the point that they now were an ends to themselves, they could lead no one to the Messiah. In other words, Moses is one last witness for Jesus Christ, and a true believer in Moses’ words will find his way towards belief in the Messiah, Jesus Christ. It is through Jesus that we are reconciled to God. No prophetic writing could ever do that for us. "14 Then those men, when they had seen the miracle that Jesus did, said, This is of a truth that prophet that should come into the world. "15 When Jesus therefore perceived that they would come and take him by force, to make him a king, he departed again into a mountain himself alone" (John 6). To the people, this was that prophet, the Messiah. Many Jews believed the Messiah would come, destroy the Roman yoke of servitude off their necks, and feed them manna for the rest of their lives. Eagerly they accepted many false Christs, hoping they had indeed found the real one and install him as their king. Jesus realized that they were going to make him king, so he could drive out the foreign invaders and give everyone plenty to eat. Just as the Jewish leaders were “looking beyond the mark” in their approach to the scriptures, so the people were beyond the pale in their hopes for a new King David. They were not interested in Jesus’ teachings of being peacemakers, merciful, and repentant followers of God; looking forward to the resurrection of the dead and exaltation in God’s presence. Instead, they sought their own Garden of Eden. And if Jesus would not give it to them willingly, they were willing to take it by force. This is similar to the attitude of the people at the Tower of Babel. They sought heaven, but sought it in their own way. They sought to build a tower to heaven, then overthrow God and his angels, so they could have the place for themselves. Instead of embracing Christ as their Savior, they wanted to bottle up his power, using it for their own wicked purposes and evil designs. Jesus escaped the people, but they soon caught up to him the next day. "26 Jesus answered them and said, Verily, verily, I say unto you, Ye seek me, anot because ye saw the miracles, but because ye did eat of the loaves, and were filled. "27 Labour not for the meat which perisheth, but for that meat which endureth unto everlasting life, which the Son of man shall give unto you: for him hath God the Father sealed. "28 Then said they unto him, What shall we do, that we might work the works of God?
" 29 Jesus answered and said unto them, This is the work of God, that ye believe on him whom he hath sent. "30 They said therefore unto him, What sign shewest thou then, that we may see, and believe thee? what dost thou work? "31 Our fathers did eat manna in the desert; as it is written, He gave them bread from heaven to eat. "32 Then Jesus said unto them, Verily, verily, I say unto you, Moses gave you not that bread from heaven; but my Father giveth you the true bread from heaven. "33 For the bread of God is he which cometh down from heaven, and giveth life unto the world. "34 Then said they unto him, Lord, evermore give us this bread. "35 And Jesus said unto them, I am the bread of life: he that cometh to me shall never hunger; and he that believeth on me shall never thirst. "36 But I said unto you, That ye also have seen me, and believe not." Jesus offered them celestial glory. They only wanted food to stuff into their cheeks. Moses offered bread/manna that lasted only a day, and then they were hungry again. Jesus offered them spiritual bread that would crown them children of God. When they asked, “evermore give us this bread”, they wanted actual bread. They did not want the gospel of Jesus Christ. The day before, Jesus fed this people and they decided he must be the Messiah of God. Now, as Christ would not feed their faces with what they wanted, they rejected him. "41 The Jews then murmured at him, because he said, I am the bread which came down from heaven. Still, Jesus tried to explain to them, He is the true bread of life. Those who ate Moses’ manna were dead and buried. But those who embraced Christ as Savior of mankind and as the Son of God would live forever in God’s presence. Again, the Jews scoffed him. They were pretended ignorance to Jesus’ teachings, refusing to partake of his flesh in symbolic form so they could be saved. Today, many people only serve God when there’s something in it for them now. Right now. Given the world as it is, most people do not think much on Christ, except in times of great need. In most cases, it is a request to be physically fed or cared for. This is not what salvation is about. We are to come unto Christ in all times and places, hoping on his resurrection to heal us spiritually. So that even if great worldly tragedies fall upon us, we can have joy and peace; assured that Jesus Christ has paid for our sins if we will just repent and place our hand in his. Discipleship comes at a price: rejecting the world and embracing Jesus and God. In this lesson, there are a few accounts of Jesus walking on water. Perhaps the most detailed and interesting is in Matthew 14. While Jesus prayed alone in the mountains, his disciples set off for a night time crossing of the Sea of Galilee. The waters were rough, and the disciples struggled. In the fourth watch, or between 3 and 6 in the morning, when they saw a person walking towards them on the water. At first they were afraid, but the Lord told them it was he. Peter asked if he could join him on the water, and Jesus told him to come to him. "26 And when the disciples saw him walking on the sea, they were troubled, saying, It is a spirit; and they cried out for fear. "27 But straightway Jesus spake unto them, saying, Be of good cheer; it is I; be not afraid. "28 And Peter answered him and said, Lord, if it be thou, bid me come unto thee on the water. "29 And he said, Come. And when Peter was come down out of the ship, he walked on the water, to go to Jesus. 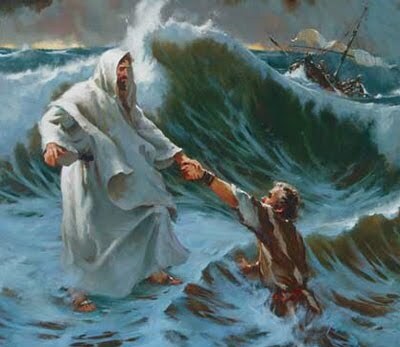 "30 But when he saw the wind boisterous, he was afraid; and beginning to sink, he cried, saying, Lord, save me. "31 And immediately Jesus stretched forth his hand, and caught him, and said unto him, O thou of little faith, wherefore didst thou doubt?" Occasionally, the Lord asks us to step out of our comfort zone in order to build faith. Peter stepped out with faith. After all, he spent the previous day watching Jesus heal many people. Initially, Peter walked with faith and boldness. But then he was distracted by the crashing waves around him. The distraction caused him to forget his Savior and the power of the Son of God. He was instantly caught up in his worldly fears and they paralyzed him. Fear replaced faith, and without faith he could not stand. He began to sink into the rough waves. Jesus miracle only worked based on Peter’s faith. While Peter believed, he could perform the miracle. When he feared, God had no power to save him. For each of us this becomes a clear warning. Satan and the world will throw many waves to crash around us. We may allow ourselves to become distracted and dismayed at the sight. Our whole world may feel like it is sinking down around us. Panic may sit in as we helplessly see ourselves go under for the third time. But the Lord would have us to focus on him. Do not let the world distract us with scary fears, politics or video games. Our focus should remain steadfast on Jesus Christ. Where our heart is, there will also be our treasure. If our focus is mainly on the distractions of the world, whether good or bad, then we are not focusing on Christ. Our faith cannot grow if it is neglected or transplanted by fear. Miracles occur when we focus our faith in Christ. He can heal us physically, emotionally, spiritually. He can give us hope when all seems lost. He can help us look forward to a better world, even when we are still engaged in this one. He can resurrect us and give us Eternal Life with God and our families, if we but believe and focus on that belief. Our faith must grow, if we ever hope to be able to have sufficient faith for Jesus to exalt us. As with Peter, we must focus on the face of Christ, and not become distracted by any wind or wave of false doctrine, thought of fear, or even pleasant distraction that keeps us from developing an eternal relationship with God. I an teaching gospel doctrine now and as I study each week I love the insight I get from reading your blog. Thank you! Thank you. My hope is that my lessons can open up new ideas and ways in which to learn and teach the doctrine. I'm glad my blog can make a difference. Thank you. Very insightful and helpful.